Well, only 6 recipes with 5 being new for this week - expect it to go back to normal somewhat as we'll be home all week. 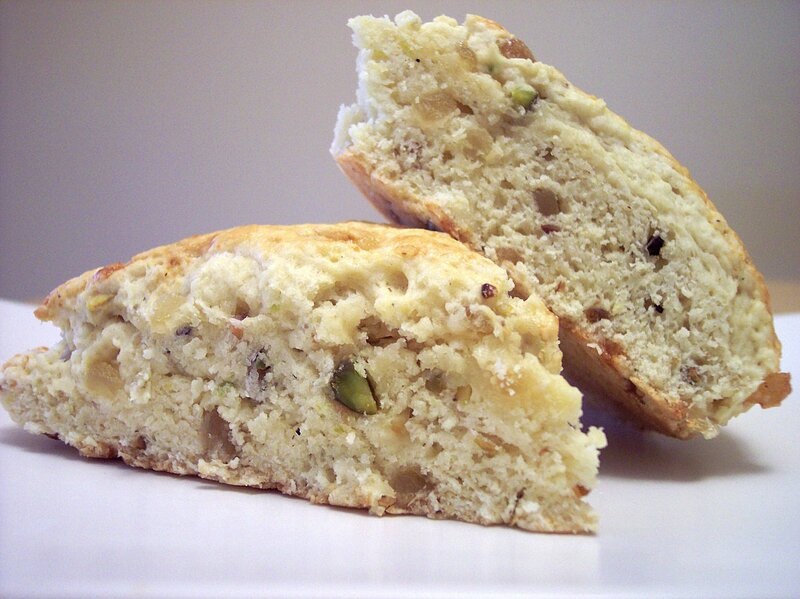 The Ginger and Pistachio Scones from yesterday were probably the favorite for us. For those wondering about housing updates - the open house was yesterday, but since it was more of a spur of the moment thing, we didn't get much traffic. The cookies went over well though I think. 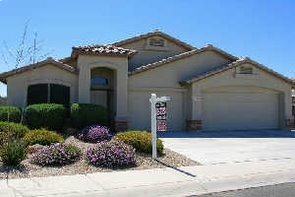 We are waiting to do serious house hunting in MD until we have a contract here in Phoenix - I would hate to fall in love with a house, but loose it because we have yet to sell this one. We could carry both, but we would rather not unless we absolutely had to. I can't wait to get started on the recipes this week - here is a couple of the ingredients that will be used is various dishes. Fresh rhubarb - I was happy we finally found this in the market again! 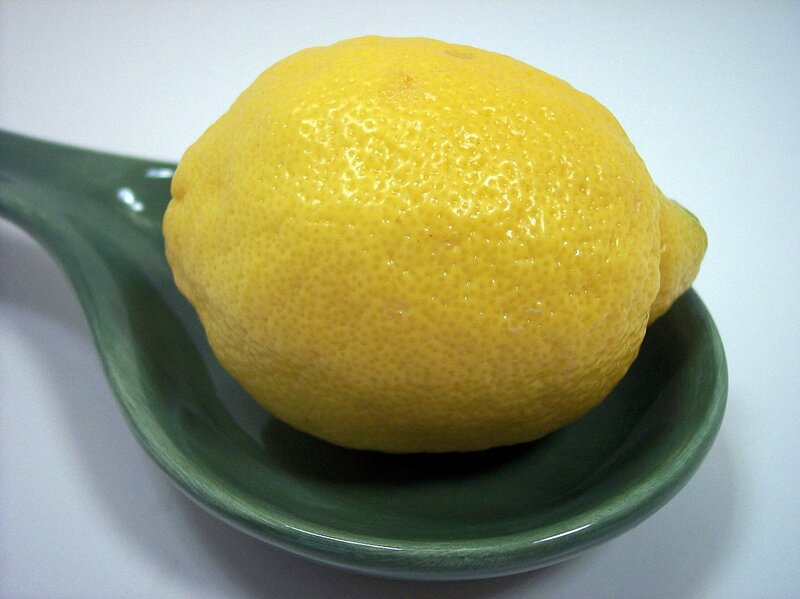 Many of the savory and sweet dishes planned for his week will also be using zest and juice of these bright yellow lemons. Tonight's Netflix movie will be Prime starring Uma Thurman and Meryl Streep. I had fun planning out this week menu last night since it felt like it has been forever since I've planned a full week. Stick around and see what happens with the fun ingredients this week! I did end up making some cookies this morning, but it was not really a new recipe. I used the Crisp Chocolate Chip Cookie recipe, but used M&Ms instead of the chocolate chips for the open house. I did bake something else new today though! Ginger-Pistachio Scones is the third scone recipe we have made and I think this one has the best combination of flavors from the ones we have tried. These do have a bit more fat in them than the others, which I am sure helped some. I needed to use up some half-and-half, but you could use cream or even milk in the recipe. It will be less rich and the texture may not be the same if you used milk though. The bits of nutty pistachios was a pleasant pair with the kick from the spicy sugared ginger. The scones are soft and light, but a little dense in a good way. Next time I might try a sprinkling of raw sugar before baking to give a sweet crunch on top. Hmm.. where to begin? Today was just one of them days you want to forget about. Here's how it went for us today. We had to leave the hotel in NJ this morning at 4:45 in order to get to the airport to catch the plane back home to Phoenix. I told Jeff "Just in case, please set up a wake-up call" to which I got a "oh don't worry about it the clock is set... but ok i'll do it anyway." Guess what? Alarm didn't go off... but the wake up call did its job! We get everything together and head down the elevator. We stand outside waiting for the car - that we had set up the night before - to bring us to the airport. 10 minutes later Jeff goes to the front desk and asks what is goin' on - They have no idea and called them to find out... "I think someone took their car, but we'll send another one... it will be 10-15 minutes." It shows up, finally; we get to the airport and get checked in. I didn't notice it at the time, but my ticket was a bit different than Jeff's. We get to the busy security check point and Jeff is whisked off to some speedy lane; I try to go with, but the guard pipped up and said "No, Sir - your ticket says you have to go into the *special* lane." Wonderful... I was flagged to be thoroughly (and it was -very- thorough...) checked out by security. So that took about another 30 minutes. We got there just in time to board thankfully. Okay... on the plane... we're good now right? I swear, that was the bumpiest plane ride we have ever been on. I had just gotten out my breakfast (whole wheat bagel with peanut butter!) when it started and the bagel flew off the tray table to land peanut butter side down onto the window. It stuck... I had to peel it off. The total trip time was something like 5 1/2 hours, and it was bumpy for about 70%. Anyway, sorry about the rant! Not much news on the house front yet - we are having an open house tomorrow though. I'll probably bake some cookies before we leave so the realtor can hand them out if he wishes. I was so tired by the time we got home I just wanted to go to bed, but I decided to just go get my exercising done and hoped it would wake me up. It did and I then ran off to the store to get stuff for tonight's dinner. To end our crappy day, I made Pork Chops with Maple Mustard Glaze along with a cheesy baked potato. The chops came together in a snap and were done in less than 20 minutes. The chops are first seared in some butter to give them a golden crust and then kept warm while you make the sauce. Dijon mustard, pure maple syrup, broth and spices are made into a thick sauce, in the same pan, so you can get all the tasty bits that stuck to the bottom. A small amount of cream is added for a kiss of richness and then the chops are added back to finish cooking in the simmering sauce. They are very tender with a hint of sweetness and a slight twang from the mustard. If your chops are fairly large, you may want to finish them in the oven so they don't burn. The white bits on the potato are kosher salt, we sprinkle it on after we rub them with touch of olive oil for a crispy skin. Over the past year or so, we have slowly been adding in red bell peppers when recipes call for them. Before, we would either leave them out or skip the recipe as we have had bell peppers before (only green though) and could not stand the taste. When we tried roasted red peppers, they gave us new insight on them and we have been having them raw and cooked in small doses. We really do like them now; but the green ones are still a bit to harsh for us. This pasta recipe, Roasted Pepper and Goat Cheese Pasta, uses quite a few peppers to create a fresh and spicy sauce to coat some bow tie noodles. Instead of using jarred roasted peppers, you can easily make your own by roasting them in the oven. When the skins turn black, you can simply seal them in a ziploc bag and as they cool, the skin will slip right off. Make sure to not peel them under running water, you wouldn't want to waste that roasted flavor! The amount of sauce is pretty generous - a bit too much though - and was a little thin, but we both loved the taste. Next time I would maybe add a little less chicken broth and probably reduce the sugar by a teaspoon - it was almost a little too sweet. 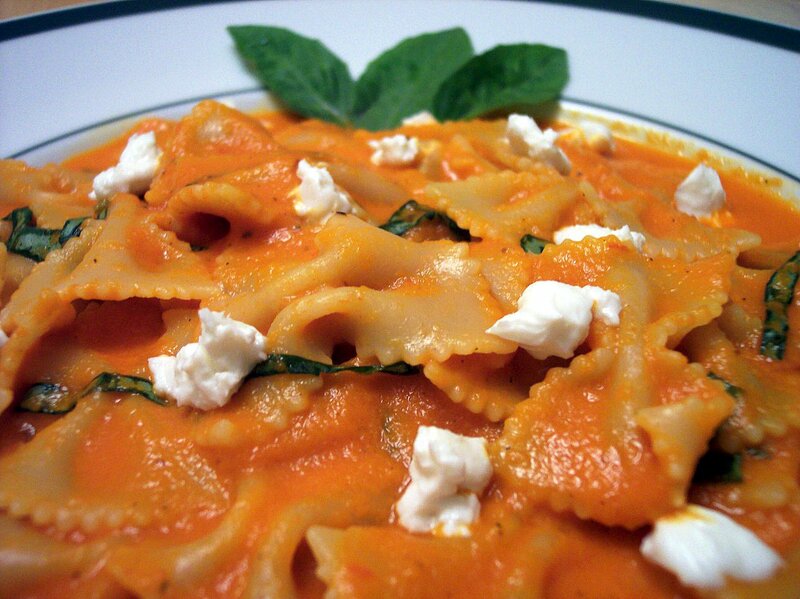 The thin slices of basil added to the freshness with creamy bits of goat cheese that tempered the heat from the crushed red pepper. Yep... treat day is back! Since we had been travelling, we missed the last two Wednesdays, which means we missed making treats for Jeff's co-workers for Wednesday Treat Day. As I mentioned on Sunday, we were going to be using pistachios in this weeks treat... and when Jeff took a bite and said "Wow! These are really good... do we have to bring them in?" I guess we picked the right thing to make! 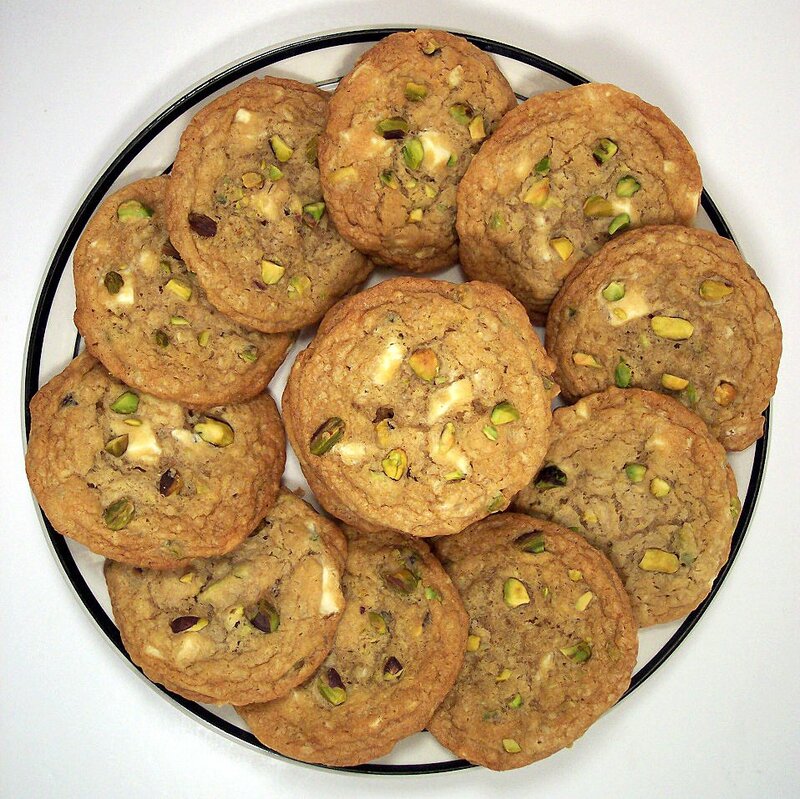 Pistachio White Chocolate Chunk Cookies have a wonderful thick crisp outer edge with a slight chew as you nibble towards the center. 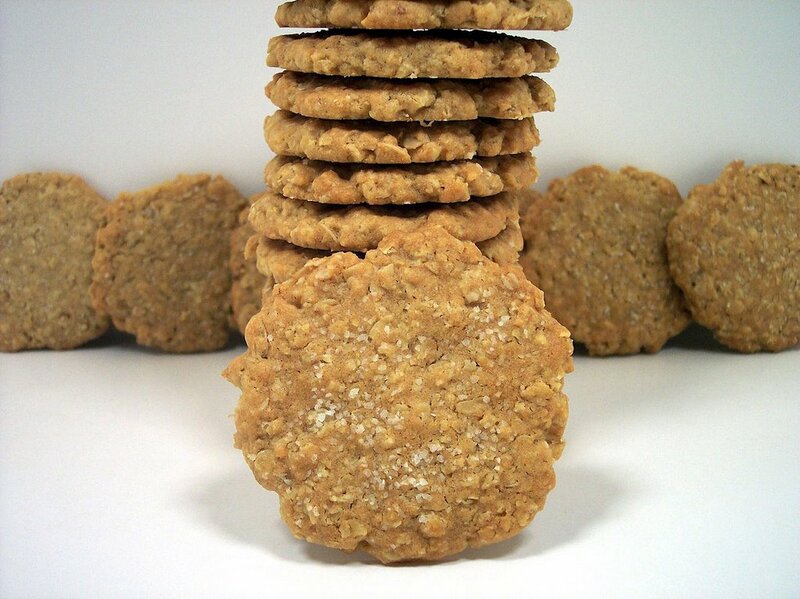 Rolled oats are whirled briefly in a food processor to chop them up a bit - this gives the cookie a toothsome texture. 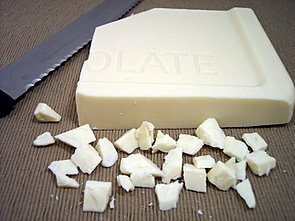 Instead of using white chips, I used a block of real white chocolate that I cut into fairly large chunks. 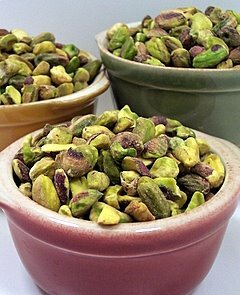 In addition to mixing the pistachios inside the batter, some of them are reserved so you can sprinkle them on the raw dough before baking. This gives them nice appearance and adds some crunch on top. 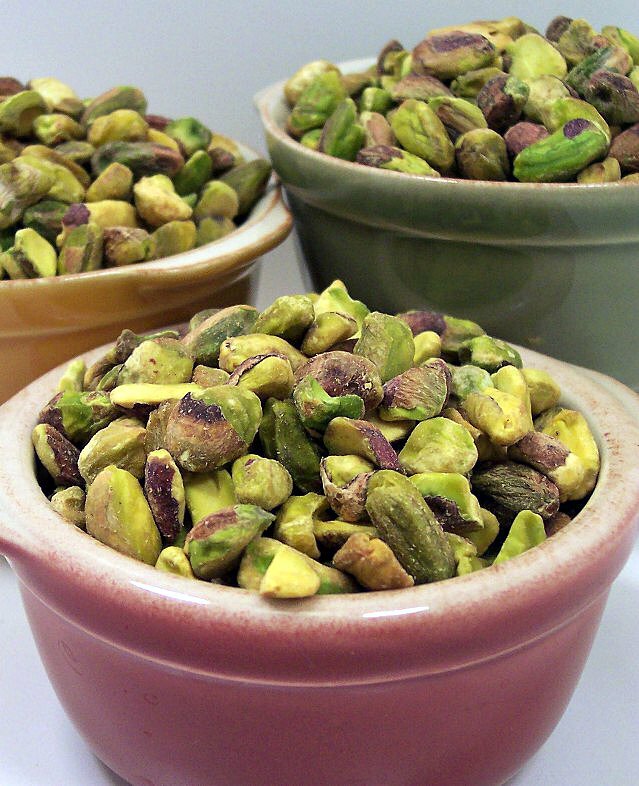 If you can find them, make sure you use plain, raw and unsalted pistachios - I get the already shelled variety at Trader Joe's. I got about 53 cookies from this batch, and they were fairly large cookies! It's tofu... again... and it was really good! 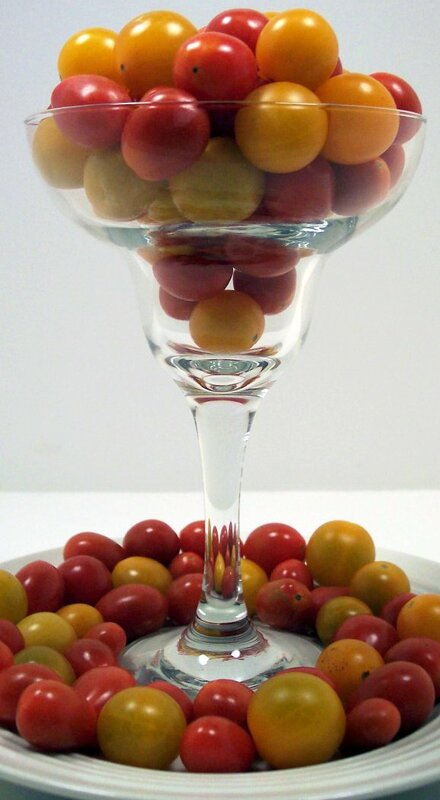 I mentioned in the post yesterday that we had a bunch of cherry tomatoes and I wanted to get them used up tonight. Tonight's dish also introduced us to another use for tofu... it was turned into a sauce! Creamy Spinach and Tofu Spaghetti starts out by roasting halved cherry tomatoes until the skins burst and they turn tender. While they are cookin' away in the oven, you make an interesting sauce for the spaghetti by pureeing fresh spinach, basil and silken tofu. Sharp cheese is also added with a splash of red wine vinegar that brightens up the flavors. This turns into a generous amount of a silky smooth sauce that coats each strand of the nutty whole wheat noodles with a fresh from the garden taste. 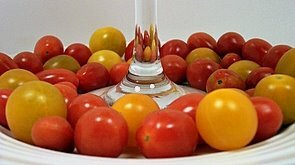 The juicy soft tomatoes bring color and add to the very heathly nature of this dish. 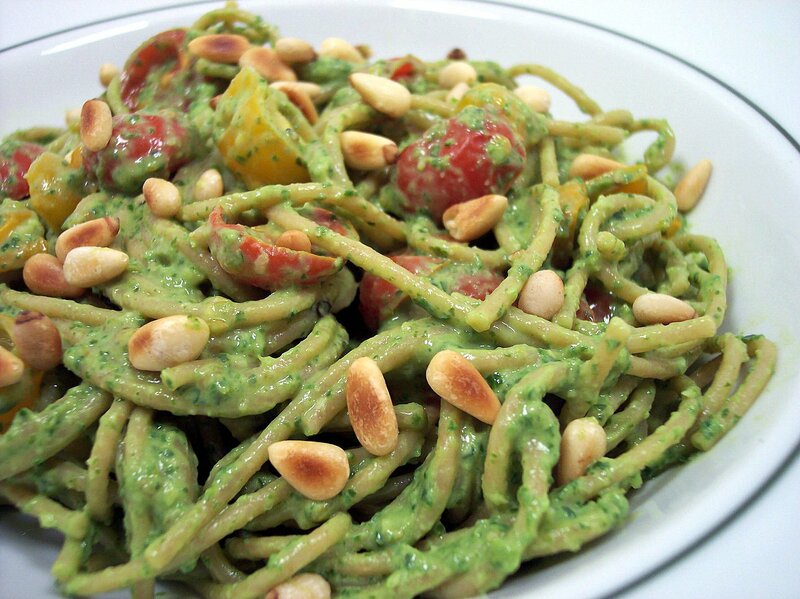 To finish, toasted pine nuts are added that bring a delicate, rich and buttery crunch. *Be sure to store your pine nuts in the fridge or freezer - since they are pretty high in fat, they can go rancid fairly fast. Because of all the travel, we only got in 3 new recipes this week... boo! 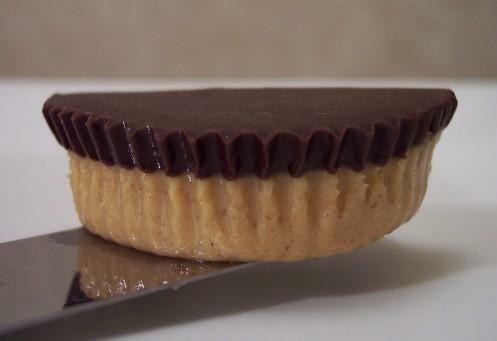 The Peanut-Chocolate Half-Moons were definitely the favorite of them! I also updated the recipe section to the left - I was about three weeks behind, but they are all up to date now! *You may need to hit refresh to see the new additions. Keeping with our Sunday tradition of giving a sneak peak at the upcoming week recipes, here are a couple items that will make an appearance (not together of course!) 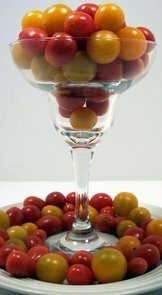 These muti-colored cherry tomatoes will be used in tomorrow's dinner. The bright green pistachio's will be turned into something for the Wednesday Treat Day for Jeff's co-workers. It looks like we are going to be flying east again the middle of next week for a couple days, so I wanted to make something to have for the long plane ride. I was sifting through the new magazines and pulled out this snack cake to try. Chocolate-Banana Snack Cake made use of a lonely overripe banana that was pleading to get used up. 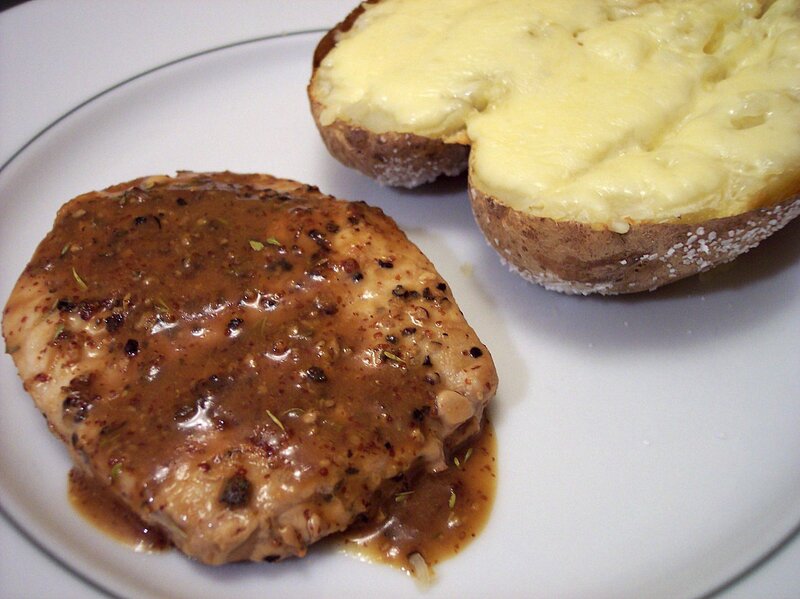 Instead of copious amounts of butter, using applesauce is a great substitute for replacing some of the fat. Because some butter is still used, you don't get that rubbery texture that can sometimes be found. In this recipe, the applesauce is placed on some paper towels to absorb some of the excess liquid to keep the batter thick. I normally use dutch-processes cocoa in these types of recipes as I find the flavor is a bit less bitter and the chocolate flavor is typically a little more intense. Since part of the leavining is baking soda, it is important to use regular cocoa to make sure you get enough lift. Instant espresso powder is used to intensify the chocolate flavor here instead, but since it is such a small amount, neither of us could taste it. 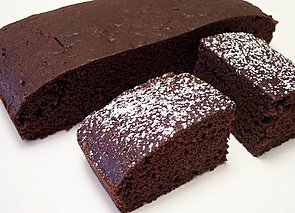 The snack cake is tender and moist with just enough banana flavor in each bite. Love the chocolate/banana combo! We would normally be watching a DVD tonight, but since we just got back, Netflix didn't receive them in time to send out some new ones! I guess it is time to get caught up on all of the shows that TiVO recorded. So we have been alluding to something that will be happening for a couple weeks now - we couldn't be very specific because of the public nature of the website. What's going on is...... We got a book deal! Okay, okay.... no, not really! We are leaving the land of dryness and the different shades of brown to an area of (from what I have seen so far!) of wetness and many shades of green! We are on the move to Maryland! Jeff has accepted a position within the same company and we will be on our way as soon as the house here gets a contract on it! I have never lived on the east coast, so this is quite an exciting move! 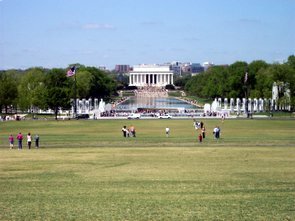 Jeff is from the east coast and will be working with some of the same people he did while he lived in Maryland a few years ago! We were out there looking at houses (sticker shock!) and the real estate market seems to be pretty close to what is happening in Phoenix. We drove out there (total of about 36 hours... we went through a lot of construction!) so we could move one car and since Jeff has family out there, we brought along the pets as they offered to watch them while the house is for sale. Poor Spike, he looks so bored! The next few weeks are going to be exceedingly busy with trips back out there and trying to keep the house clean for showings - yesterday we had a showing and they called to view the house just as I pulled the last batch of the cookies out. I'm wondering what I will do if I'm in the middle of baking something and someone just shows up! So things around here might be spotty at times if we are out travelling. So... I never thought this far ahead I guess... can we still be Culinary in the Desert if we don't live in the desert anymore? 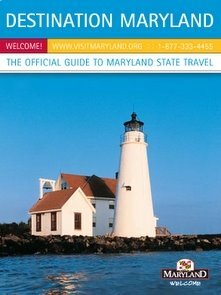 Any tips for life in Maryland? Or... anyone want to buy a house? So with that out of the way... we can move on to tonight's dinner. 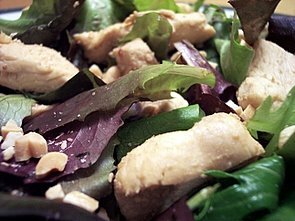 Stir-Fried Chicken Salad is a quick, light and easy salad that was a refreshingly healthy change from some of the on-the-road food we had. The chicken is quickly marinated in a combination of flavors that ends up being the dressing for the salad. Quicky stir-fried in peanut oil, the chicken turned out quite juicy and tender. I used a bagged baby romaine mixture for the greens and there was just enough of the slightly sweet dressing to coat everything fairly well. Chopped peanuts are added at the end to bring a crunchy and nutty finish. Whew! We flew out of Baltimore yesterday and the plane was a little late in leaving, so we finally got back to the house around 9pm last night... too late to start something for dinner. We pretty much just went to sleep. If you're wondering what's going on - I'll finally be giving the update in tomorrow's post with the info. We have been waiting on some details to be worked out. Trying to get back into the swing of things, I did manage to crank something out from the kitchen today. I needed something to bring over to the Vet to thank them for all the stuff that have been doing for the pups lately, so I opened up a favorite cookie book and went lookin'. 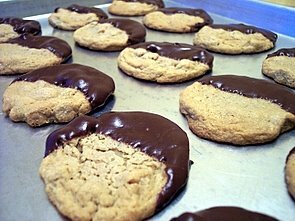 Jeff said the recipe for Peanut-Chocolate Half-Moons sounded like the way to go and I agreed. 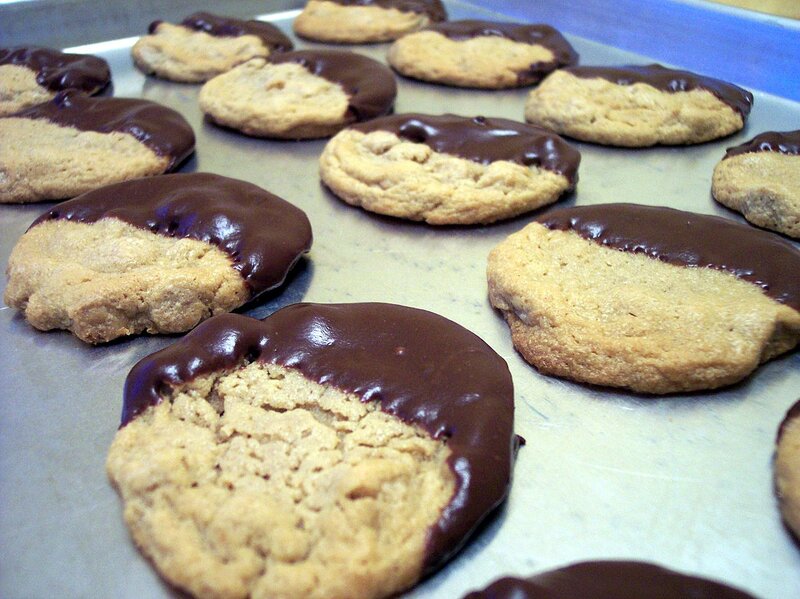 These cookies are stuffed with peanut butter chips and then half dipped in a creamy, smooth and fudge-like icing. The cookies are taken out from the oven when they still look pretty soft, but as they cool, the texture turns into a crisp/chewy combo. 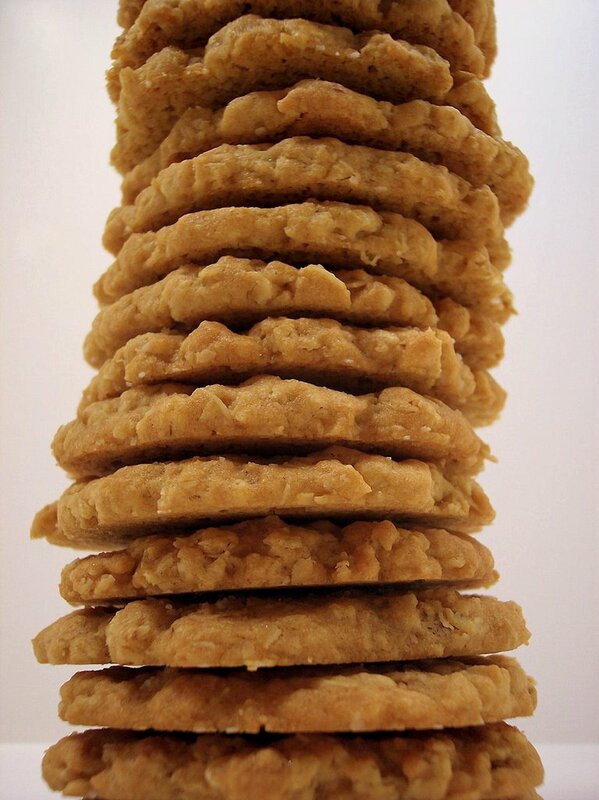 Each cookie has a strong peanut buttery taste with the thick icing taking these simple cookies over the top with its rich flavor. We are still on the road here.... after about 2600 miles of driving we've ended up in this area.... We should be able to give an update about what is going on in a few days.... look for us to be back to normal on Thursday! Bigger picture as always if you give it a click! Hope everyone who celebrates is having a great holiday today! 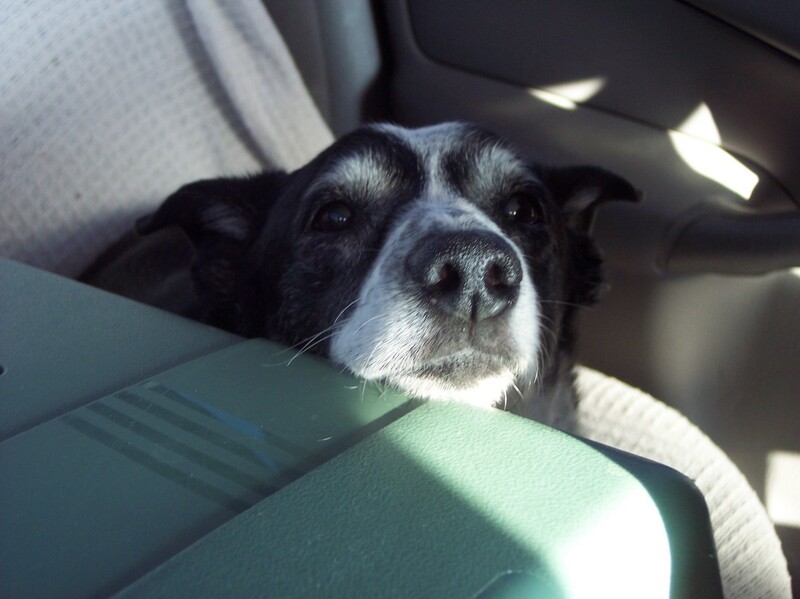 We are out of state traveling so the daily updates might be hit or miss depending on internet connectivity - we should be back to normal on Thursday. Before we left we had to make something Easter related, so we went with some little egg-shaped cakes! I did not want to make a large recipe, so I went looking in the Small-Batch Baking cookbook. We decided on the White Chocolate Layer Cake recipe. It was suppose to make enough to fill 2 15 ounce cans, but I used the Reyonlds egg shaped foil cups instead. We got 4 individual sized cakes - the white chocolate flavor was subtle, but you could easily tell that it was there. We had some guests show up when we had started to decorate, so we let them do some fun piping and decorating with some buttercream I made. These little cakes were surprisingly moist and I think we may have to try to increase the ingredients to bake up a larger version. We eat in the morning too! So we have been known to do quite a few breakfasts for dinner, I think it is about time we had something new for breakfast! 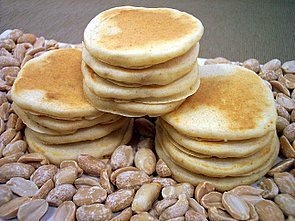 The recipe, Peanut Butter Pancakes uses a combination of half all-purpose flour and half whole wheat pastry flour to keep them light. If we were to use all whole wheat flour, they might have been a little too heavy for our taste. There is a pretty small amount of sugar in the recipe which adds just enough sweetness. We typically don't buy crunchy peanut butter, so we just used about 3 tablespoons creamy and chopped up about a heaping tablespoon of peanuts and mixed them together. I also used a vanilla soy milk which added another background of vanilla flavor. The pancakes are light with a little puff from the baking powder. The nuts brought some crunchy little surprises in each bite. What can I say.... it's another meatloaf! Unlike some other ones we have done recently, there are no surprises inside or funky combinations. Barbecue Meat Loaf is simply mixed in a single bowl and then then shaped free-form style on a broiler pan. The original recipe has you put only 1 tablespoon of the barbeque sauce in the mix, but we upped it to about 3 because the beef was pretty lean and we didn't want it to be too dry. There was still plenty left over to spread over the top so you could even add a little more to the mix. 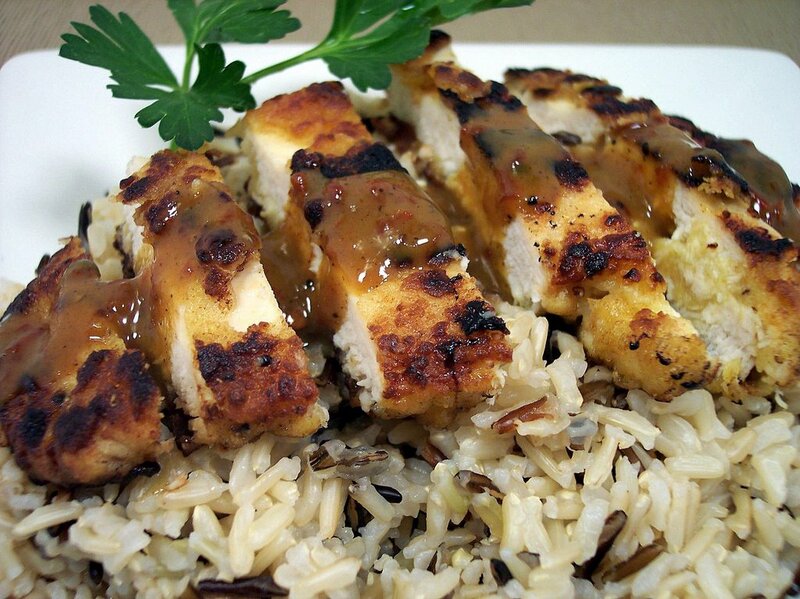 The sugars in the sauce darkened the top and lent a subtle caramelized sweetness. The loaf held its shape and didn't fall apart when we were slicing. It was still a tad on the dry side, but we really liked the smoky flavor from the sauce. We also used a hotter chili powder which gave it a nice kick. The slice is just the right size for a sandwich too... guess what lunch will be? We go through a fairly large amount of eggs around here... we sometimes end up buying the huge 5 dozen packages at Costco about twice a month. I am always watching for recipes that use them, so dinner was another breakfast type dish. 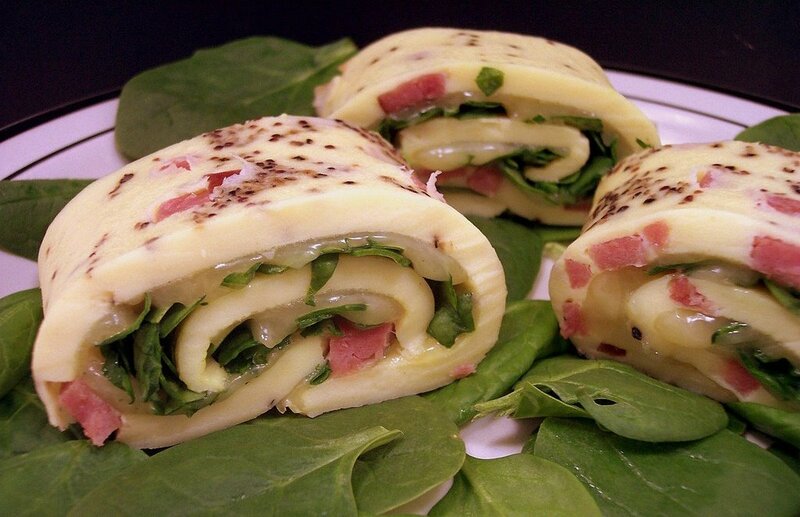 Rolled Ham and Swiss Omelet turned out to be a fun and pretty fool proof way to make an omelet. The base egg mixture is whisked together and then poured into a 10x15" pan and sprinkled with chopped ham. So instead of messing with a pan on the stove, this gets baked in the oven until a little puffy and just set in the center. As soon as it is ready, you remove it from the oven and sprinkle some nutty swiss cheese and chopped fresh spinach over the top. Then you roll up starting at the wide end and because you lined the pan with foil, you can use that to help form the log. The warmth from the eggs melts the cheese which helps hold the long cylinder shape. Using a serrated knife, we were able to cleanly slice pieces without squishing all the insides out and they held together just fine while moving from the board to the plates. The texture of the eggs were a little more creamy with this method and the fresh spinach added a brilliant green color against the white cheese and golden eggs. I had been eyeing these new stand-alone baking cups from the Reynolds foil people for a few weeks now and wondered how they would really hold up for baking. I was going to be needing a portable snack and I've been wanting to try another recipe from the One Smart Coookie cookbook. I browsed through it and found the recipe, Coffee White Chocolate Chunk Brownies, and was drawn to the recipe. I thought about changing the name, as to me it is more of a blondie and I used espresso powder instead of coffee, but we'll leave it as is. The recipe does not use a lot of dishes and it gave me a chance to use the chunk of white chocolate I talked about earlier. 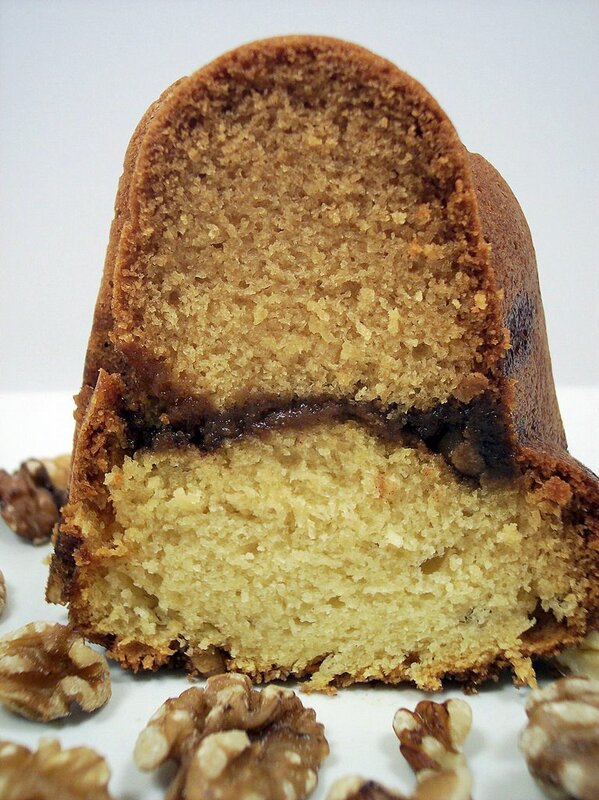 The brownie/blondie has a crackly top with the insides being chewy and sweet. I am hesitant to call them "fudgy" as I would use that for a chocolate recipe, but they are definitely not cake like. The espresso powder did not make them have a strong coffee flavor, but you can tell it is there and I found it to punch up the creamy white chocolate. You could bake them in a 8x8 square pan, but because I used the fun shapes, I was able to get 12 decadent and perfect sized individual serves. I found the foil cups to be pretty sturdy, but they can lose their shape if you are not careful moving them around. 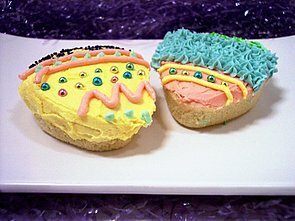 I set them on a large baking sheet before filling them and that seemed to solve any issues. I sprayed half of them using Pam with Flour and left the other half naked. After I let them cool, both kinds came out very easily! I think the best part is that if you were to have any issues, the foil just peels away surprising easy. Happy with the results, I already have plans to use these again later in the week! 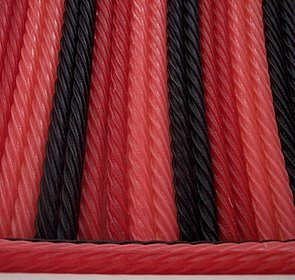 Tomorrow is National Licorice Day... Who knew there was such? I never really liked licorice growing up, but Jeff as it turns out, ate it quite a bit! 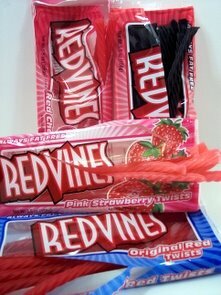 Red Vines was kind enough to send us some to try - I had and really liked the pink strawberry twists - but I have a feeling Jeff will be finishing the rest as he already hid them! 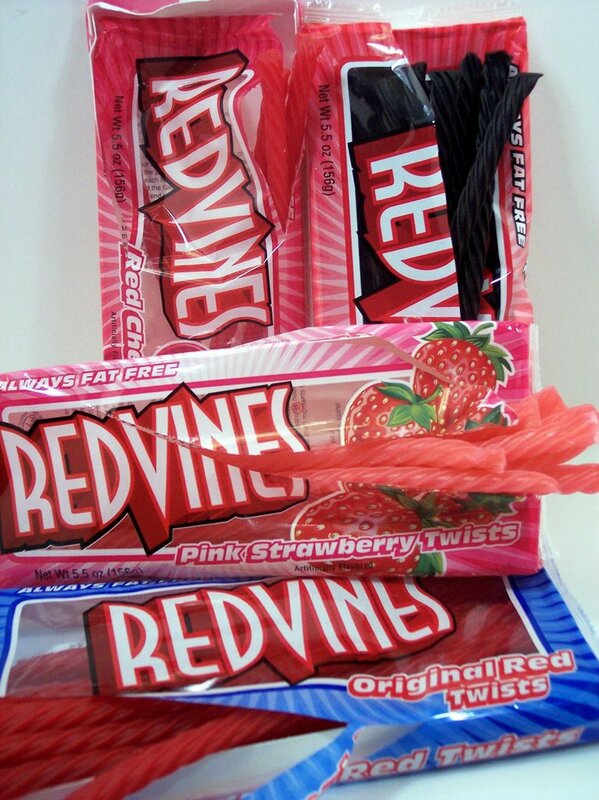 Red Vines also has a contest out - have some fun and enter something! While we have made a few Mac and Cheese recipes before, the recipe we made tonight was definitely the quickest to make. It is not too traditional, but it is quite healthy and very tasty. This recipe, No-Bake Macaroni and Cheese, takes a turn from the norm as it has some broccoli that cooks along with the noodles. For the pasta, I used the Barilla Plus version again as we have found it to have a great texture. 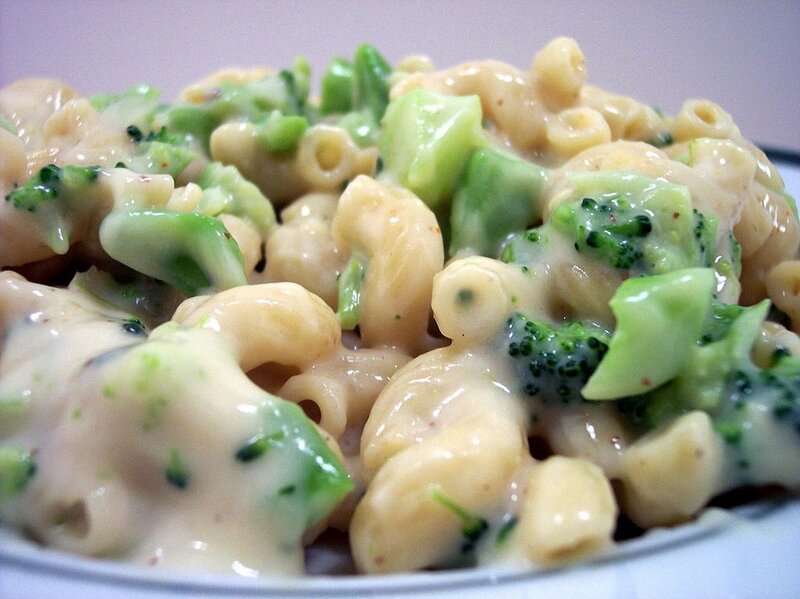 The tender broccoli and pasta are cloaked in a creamy, thick and very cheesy sauce made from plain soy milk, sharp white cheddar and Parmesan that adds a salty bite. Jeff was afraid that the broccoli might overpower the flavors, but it added a nice texture and bulked up each serving. This came together in under 30 minutes which made it a great weeknight dish - this will also be a great lunch tomorrow! Nine more new recipes were tried this week. If we had to choose, I think our favorites were the Salty Oatmeal Cookies and Mixed Salad with Hoisin Vinaigrette and Crisp Panko Chicken. Life is getting pretty hectic, so things might be a tad slower around here. Only time will tell with what actually happens - sorry we have to be so vague. 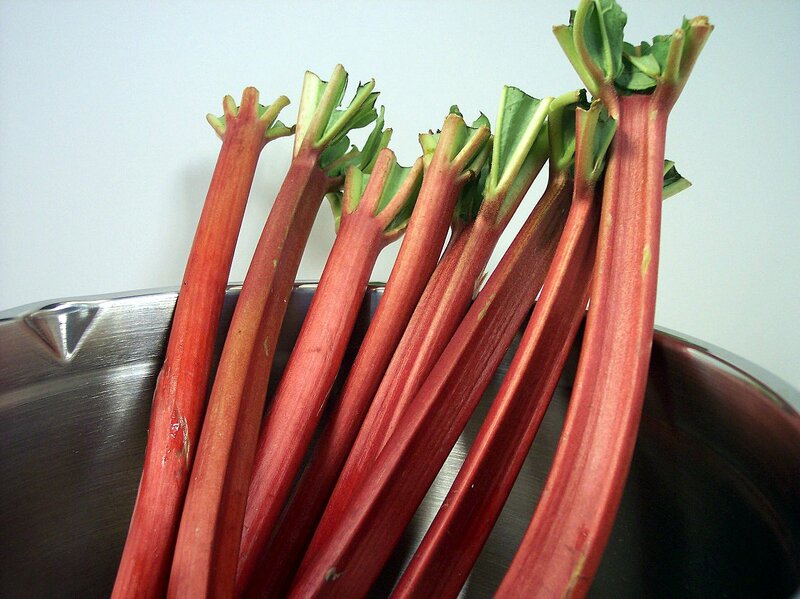 Here's a peak at an ingredient that will make two appearances this week! We didn't have a chance to drive out to Whole Foods to get our favorite white chocolate, but this chunk of Ghirardelli will do nicely! Tonight's movie from Netflix will be Serenity with Nathan Fillion and Gina Torres. I have been waiting to see this movie since we finally finished watching the series Firefly - first on DVD and then on the Sci Fi channel. I wish they would have continued on with the series... Check back and see what else we will be workin' on in the kitchen this week! Jeff has been asking me to do a dessert type dish that involved apples for awhile now. He didn't really have a preference on what kind, so we went back and forth trying to figure out what he would like from the many apple recipes waiting to be tried. 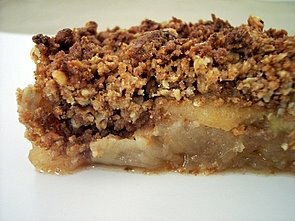 I ended up going with an older EW recipe - Old-Fashioned Apple-Nut Crisp. After peeling and slicing up some granny smith apples, they are mixed with brown sugar, cinnamon and fresh lemon juice. The apples then go into the oven to prebake while you make the topping. Whole wheat flour, rolled oats and brown sugar is cut with a bit of cold butter and then mixed with canola oil and apple juice concentrate to moisten. Hazelnuts are mixed in for some crunch and nutty flavor. After about 30 minutes, the sweet clumpy topping is scattered on top and then back it goes to finish baking. The result is tender, tart and juicy apples that are shrouded by a nutty, crisp and flavorful crust. As it cools, the juices are reabsorbed and we were able to cut them pretty cleanly. The brown sugar adds just enough sweetness that pairs well with the bits of chunky hazelnuts. You can you use walnuts instead, but I think the hazelnuts brought a unique and different flavor to this dish. 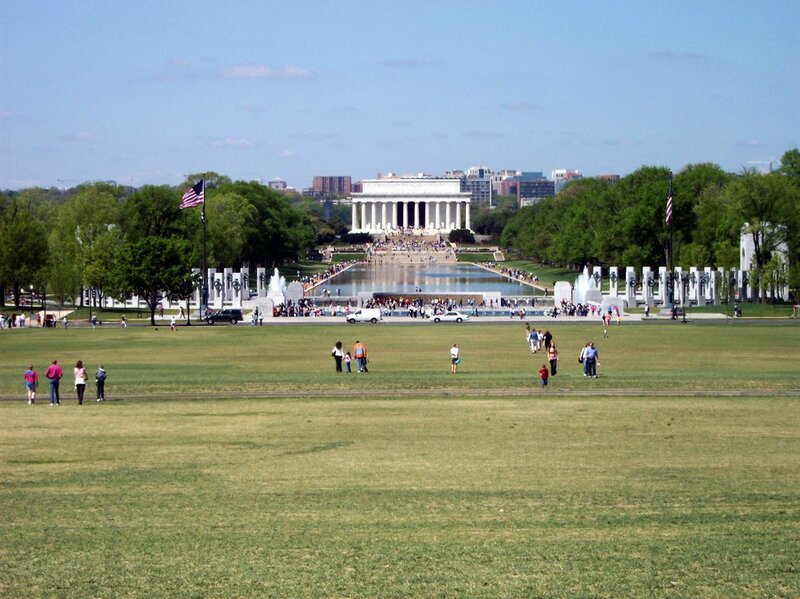 Tonight's netflix movie will be Missing in America starring Danny Glover, Ron Peralman and Linda Hamilton. Another movie I've never heard of - hopefully it won't dissapoint! The update on the cookies from last night's post is.... very good! They kept their crisp texture so far in a sealed container and remained fairly chewy - the rest are going into the freezer to see how they do there! Dinner tonight awoke our senses with a pretty spicy chicken dish! Chipotle-Orange Chicken Cutlets has a smoky, spicy and tangy sauce made from orange juice concentrate, a bit of water and chipotle chiles. 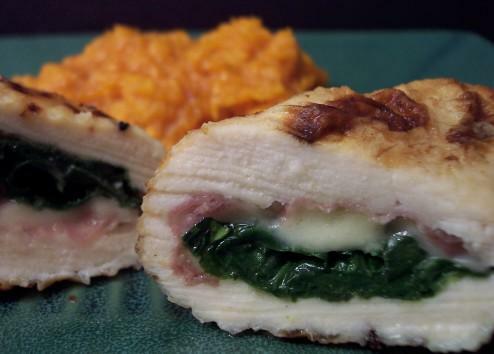 The chicken is pounded reasonably thin and then lightly coated with flour. It goes through a quick dip in orange juice concentrate and then back into the spiced flour mixture to ensure a crunchy crust. To cook, butter is melted with canola oil for flavor and to protect the butter from burning to quick. The cutlets are cooked until they achieve a deep golden brown crust on each side and then removed. The sauce mixture is then added and allowed to boil for a couple minutes since raw chicken was dipped in the concentrate. This mixture can become pretty thick, so if needed, add a couple tablespoons or so of water to thin it out some. We served this on top of a brown and wild rice mixture. From chocolate covered pretzels to kettle corn and trail mix, Jeff and I both enjoy the salty/sweet combination of flavors - especially with snacks. Today I made a cookie which brings these two together and had us both going back for bite after bite. 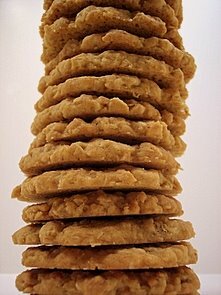 Salty Oatmeal Cookies moved near the top our list today because they baked into one of our favorite textures in a cookie. 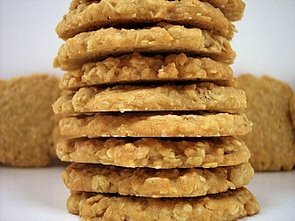 The outside of the cookies are crisp (but not crunchy hard) while the middle has a wonderful chewiness - if you tried to break them in half, they would start to bend instead of just breaking apart. 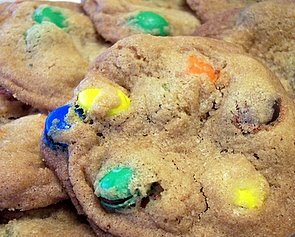 At first bite, you can taste the saltiness on your lips, but it is not overpowering and the sweetness from the sugars in the cookie tone it down. The salty flavor comes from coarse kosher salt is sprinkled on before baking. 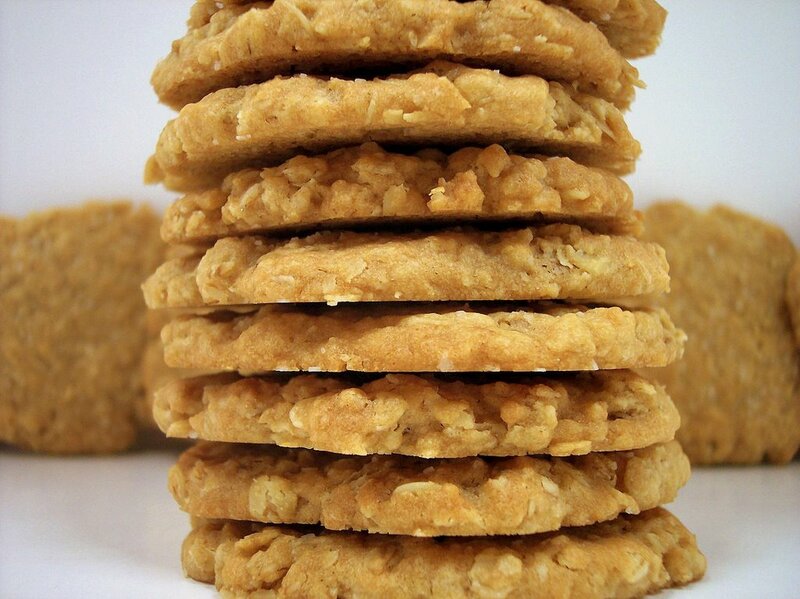 As you eat them, the old-fashioned oats add a nutty taste and a pleasant chew. They are about 3" across and just over 1/4" thick. 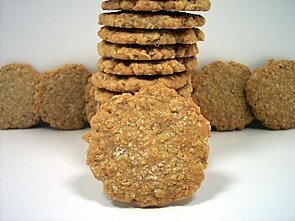 There are no fancy add ins and I'm glad we kept them plain - the salty/sweet combination really shines through in these cookies. We will have to wait and see how these keep, butI hope they can maintain their texture being stored. Tonight's dinner is a firm polenta dish made from white cornmeal. 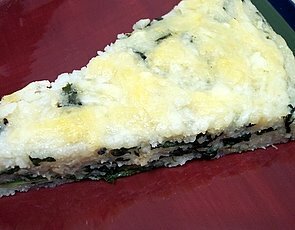 The recipe, Polenta with Fontina and Spinach, can be partially made the morning of or the night before you want to serve it. First, tender baby spinach and garlic are lightly sauteed and then mixed into a warm cooked white corn polenta. This is then spread into a springform pan and allowed to set and cool in the refrigerator. Creamy shredded fontina cheese is scattered on top and then baked until the top turns a pale golden color and the center has warmed up. The firm polenta can then be easily cut into wedges and while we ate it as a main dish, if you cut them into smaller wedges, this would be a great side item. If you don't care for fontina, I think Asiago or Parmesan would also work well. Tonight's dinner turned out to be a pretty interesting combination of textures and flavors. 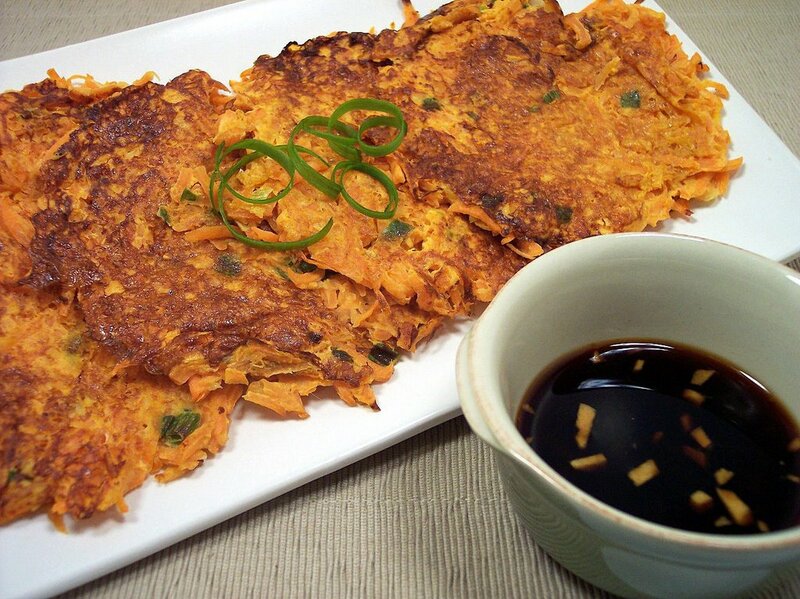 For the side tonight, I made Shredded Carrot-Ginger Pancakes with Asian Dipping Sauce. A mixture of carrots, ginger, garlic, green onions are combined and bound together with a couple eggs along with breadcrumbs. You scoop portions of this on a hot griddle and cook until each side gets a caramelized finish. The texture was not as crisp as I was expecting - it was firm, but lacked a crunch. The bite from the ginger with the sweet carrots was an exciting combination when dipped into a salty soy sauce mixture. Other than the missing crisp texture, the flavors make it worth it to try this recipe again with a bit more oil. 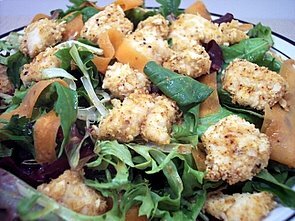 To go along with, I served a Mixed Salad with Hoisin Vinaigrette and Crisp Panko Chicken. The vinaigrette made this salad come alive! Gourmet salad greens are coated with a slightly spicy and kinda sweet dressing where again, ginger makes itself known in a pleasant fashion. The coating also helps cut down on the bitterness from some of the salad greens. Green onions bring a fresh flavor while shaved carrots add a pop of color to the salad. For some protein, chunks of chicken breast are coated in panko and chili powder, then baked until golden and crispy. Another Tuesday of baking treats for Wednesday Treat Day so Jeff can bring in stuff for his co-workers. He wanted something bite sized this time, so we went mini muffins! 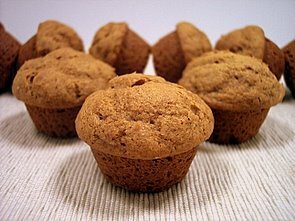 Mini gingersnap muffins are almost cupcake like because of the way the batter is mixed. The butter and sugars are creamed together first before adding the rest of the ingredients. The gingersnap part refers to the spices used - ginger, cinnamon and cloves along with a healthy dose of molasses for a rich dark color. 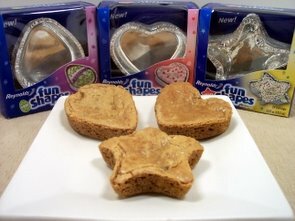 These bite sized treats are very moist and tender from the sour cream added at the end. I ended up with 48, but I only have 1 mini muffin pan that has 24 wells. While I could have put the rest of the batter in a large muffin pan, I decided it would be a good chance to test the batter to see if it could sit while the first batch baked. After the first set were done, I quickly rinsed the pan in water to cool it down and filled it with the remaining batter. I was happy to see they rose just as high as the first ones! I will finish them off in the morning before Jeff brings them in with a dusting of powdered sugar for a touch of sweetness, but they were just as tasty naked! 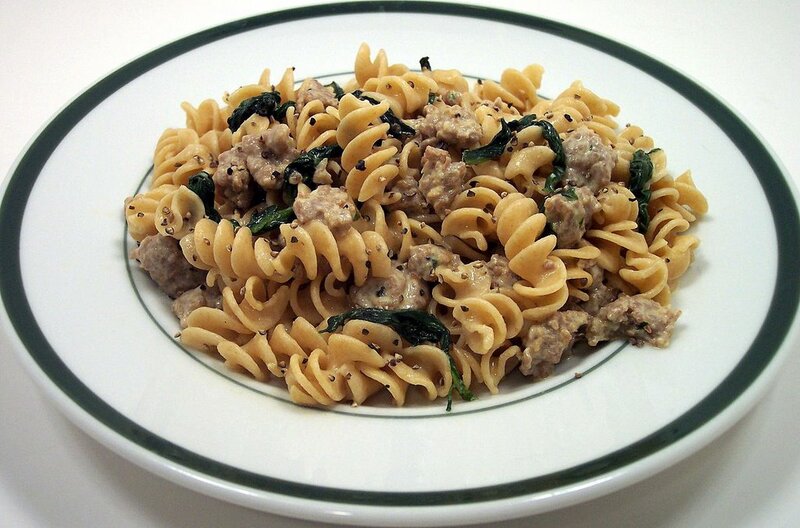 Dinner tonight, Whole Wheat Rotini with Spicy Turkey Sausage and Spinach took a few steps to complete, but we think the flavor in the end was worth it. The original recipe calls for Mustard Greens, but we opted for the less bitter baby spinach. For an interesting start, you begin by reducing some chicken broth to intensify the flavor of the sauce you make at the end. 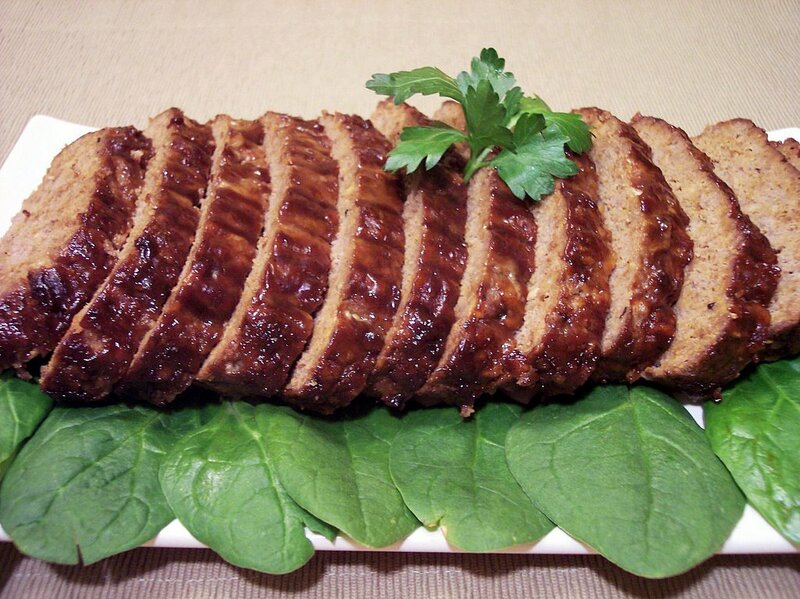 Spicy, but lean, hot Italian turkey sausage is browned and then the baby spinach is added in and allowed to wilt. The reduced broth, some half/half and fresh grated pecorino Romano cheese are added in to create a creamy sauce. To complete the meal, the sausage/spinach mixture is served over slightly nutty whole wheat pasta which absorbs the flavorful sauce. Tonight's dinner, Asian Chicken Noodle Soup, was a quick-to-make light soup to enjoy outside on the patio as the temperature has started to rise out here in Phoenix. 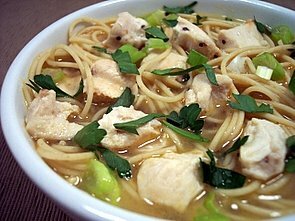 The base flavors of garlic, ginger and lemongrass are lightly sauteed before the chicken broth and water is added to intensify their essence. As it comes to a boil, angel hair pasta and diced chicken breast are added and allowed to cook for about 5 minutes. Once the time is up, the pan is set aside and allowed to sit off heat to finish cooking the pasta and to let the flavors meld. The broth has a refreshing, silky and light lemon-y taste from the lemongrass with just the right amount of bite from fresh ginger and the red chile. The original recipe says it serves 8, but I plated it into 3 portions for a main dish. We did another 10 new recipes this week and it is hard to choose which were the stand-outs this time. We'll go with Walnut Coffee Cake, Lavender Biscotti and the Cumin Roasted Potatoes. I mentioned in yesterday's post that we got a new kitchen gadget. 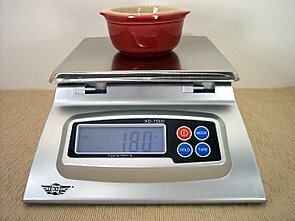 I have been using a scale for measuring the weight of ingredients for a few years now. This makes cooking/baking much faster for prep and I get more consistant results. The old one finally gave out and we went on the search for a new one. I would have bought the same one we had before as it worked well, but I found one that had a few features that sold it to us. The only thing that bugged me about this scale is the "splash guard." 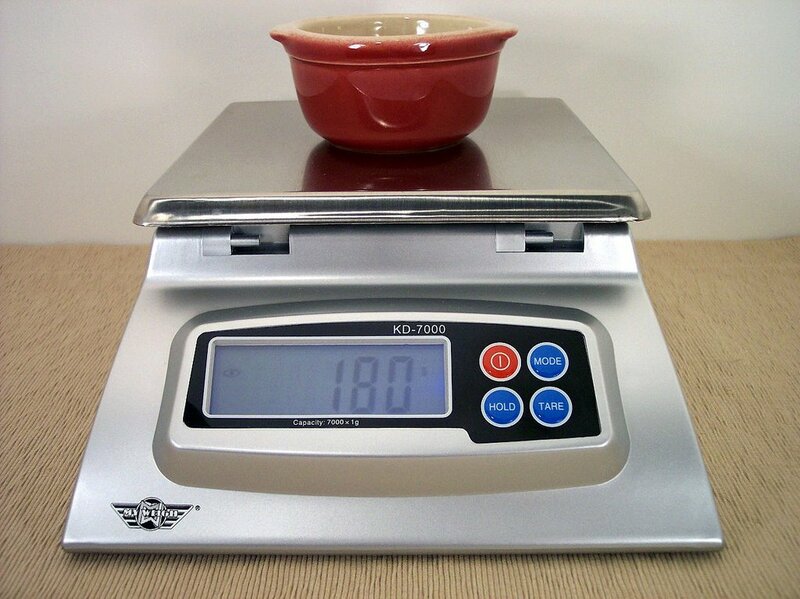 It flips up, instead of down, so if your not careful it will mess up the weight as it touches the plate on top. You can easily remove it so it is not a problem, but it would have been a better idea to have it flip down. Tonight's DVD from Netflix will be Doom starring The Rock. I played the PC game when I was younger, so we have been interested to see how they turned it into a movie. Many more new recipes to try out this week, so keep checkin' back so see what comes from our kitchen next! One of the gifts I received for my birthday in March was my first ever large shaped bundt pan. 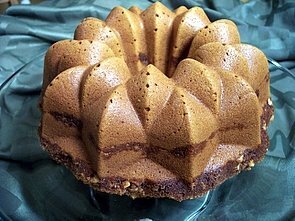 I have had an angel food pan, but I never got around to buying a bundt for myself. 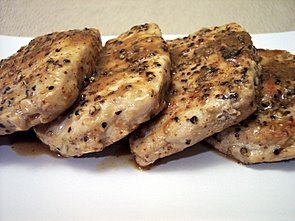 I couldn't decide what I wanted to make first, but the recipe I used today caught my eye as I had everything on hand and it sounded really good! Walnut Coffee Cake has a sweet layer of brown sugar, walnuts and cinnamon that weaves its way through the inside of the cake. This mixture is also sprinkled on top of the batter before baking to add another layer of flavor. The tender and moist cake came out surprising easy and nothing stuck to the pan - hooray! I only used Pam with Flour and that seemed to do the trick. 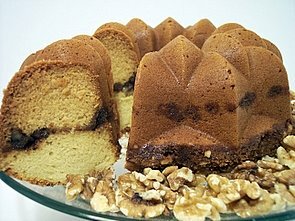 The crunchy walnuts added a nice texture to bite into against the rich cake. I will freeze most of the pieces and I'm sure they will be just as fresh as the day we made them when we are ready for more. This cake had a lot of oomf for being on the lighter side! Tonight's weekend Netflix movie will be Two for the Money with Al Pacino Matthew Mcconaughey. I already have ideas floating around for the menu this week, but we will sit down and figure it out after the movie. Check back tomorrow when I'll be talking about a new kitchen gadget I got!